BEIRUT (AP) — Syrian state-run media reported that the country’s air defenses confronted a new “aggression,” shooting down missiles over the central region of Homs early on Tuesday. The reports did not say who carried out the pre-dawn strikes. The government-run Syrian Central Media said the missiles targeted the Shayrat air base in Homs. Earlier this month, four Iranian military personnel were killed in an airstrike on Syria’s T4 air base, also in Homs. Syria and its main allies Iran and Russia blamed Israel for that attack. Israel did not confirmed or deny mounting the raid. The reports came just a few days after the United States, Britain and France conducted airstrikes targeting alleged chemical weapons facilities in Syria, in retaliation for a suspected chemical weapons attack that they blamed on the Syrian government. Experts from the international chemical weapons watchdog are now in Damascus and have been waiting to visit the site of the suspected chemical attack in the town of Douma, just east of Damascus. On Monday, Syrian and Russian authorities prevented investigators from the Organization for the Prohibition of Chemical Weapons from going to the scene, the head of the OPCW said, blocking international efforts to establish what happened and who was to blame. The U.S. and France say they have evidence that poison gas was used in the April 7 attack in Douma, killing at least 40 people, and that Syrian President Bashar Assad’s military was behind it. But they have made none of that evidence public, even after they, along with Britain, carried out airstrikes on Saturday, bombing sites they said were linked to Syria’s chemical weapons program. Syria and its ally Russia deny any chemical attack took place, and Russian officials went even further, accusing Britain of staging a “fake” chemical attack. British Prime Minister Theresa May accused the two countries — whose forces now control the town east of Damascus — of trying to cover up evidence. The lack of access to Douma has left unanswered questions about the attack. OPCW Director-General Ahmet Uzumcu said Syrian and Russian officials cited “pending security issues” in keeping its inspectors from reaching Douma. “The team has not yet deployed to Douma,” Uzumcu told an executive council meeting of the OPCW in The Hague on Monday. 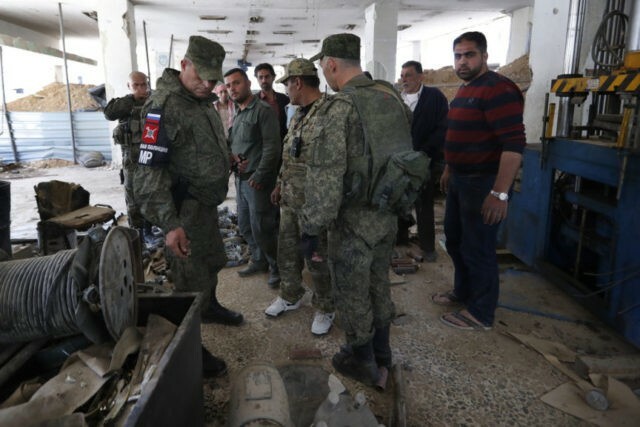 Russian military police were ready to help protect the OPCW experts on their visit to Douma, said Maj. Gen. Yuri Yevtushenko of the Russian military’s Reconciliation Center in Syria. Igor Kirillov, a Russian chemical weapons protection expert in The Hague, said the team is set to visit the site Wednesday. “As far as I understand, what is hampering a speedy resolution of this problem is the consequences of the illegal, unlawful military action that Great Britain and other countries conducted on Saturday,” he said. Until Saturday, Douma was the last rebel-held town near Damascus, and the target of a government offensive in February and March that killed hundreds and displaced tens of thousands. Hours after the alleged chemical attack, the rebel faction that controlled the town, the Army of Islam, relented and was evacuated along with thousands of residents. He and two other residents accused the rebel Army of Islam of carrying out the attack. As they spoke, government troops were not far away but out of earshot. Nuseir said a gas cylinder was found leaking the poison gas, adding that he didn’t think it was dropped from the air because it still looked intact. Separately, the AP spoke to a medic who was among those who later were evacuated to northern Syria. Ahmed Abed al-Nafaa said helicopters were flying before the attack and when he reached the site, people were screaming “chlorine.” He said he tried to enter the shelter but was overcome by a strong smell of chlorine and his comrades pulled him out. Associated Press Writer Bassem Mroue in Douma, Syria, contributed to this report.